This week I was hoping to be giving you a review of The Bottle Shop, the wine bar that is going into the old Goetz Bros. Sporting Goods storefront on Broadway, across from City Pub. However, they continue to be a bit behind schedule: I’ve been told that while the place is done, they are now waiting on the city for a final inspection. Expect to see them open very soon — and expect to see a review from me once they are indeed open. Not being able to report on The Bottle Shop this week is fine, though, since I have something else I want to talk about. 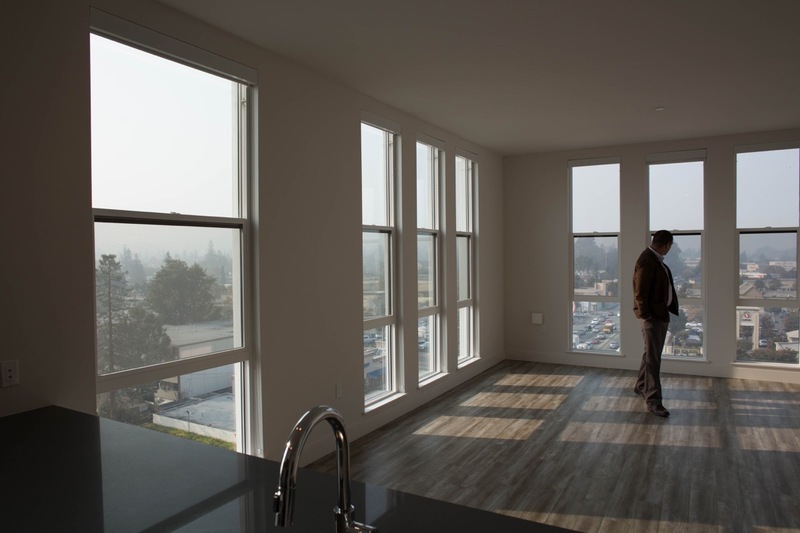 If you read last week’s column you might have picked up on the fact that my opening photo, which depicted the smoky conditions that we were experiencing at the time, was taken from inside of Huxley, Redwood City’s newest apartment building. A couple of weeks ago, in one of my articles, I mentioned that I was hoping to take a tour of Huxley. It seems that the folks at Greystar Development, who built that particular building, read what I wrote: they got in touch and offered to give me a tour. Naturally I jumped at the chance. My tour was given by Amy Strand, one of Greystar’s property managers. We were accompanied by Troy Vernon and Jonathan Fearn, two of Greystar Development’s point people for projects such as this (I previously met both Troy and Jonathan at one of the workshops for Greystar’s proposed 1601 El Camino Real project). We began our tour by looking at the building’s ground-floor amenities. From the leasing center (which is on the corner of the building closest to where Greystar’s 1409 El Camino Real project is now well underway) we walked through the library, which is a cozy little room with comfy chairs and a couple of workstations. Next, we passed a wall of mailboxes before stepping into the well-equipped fitness center. 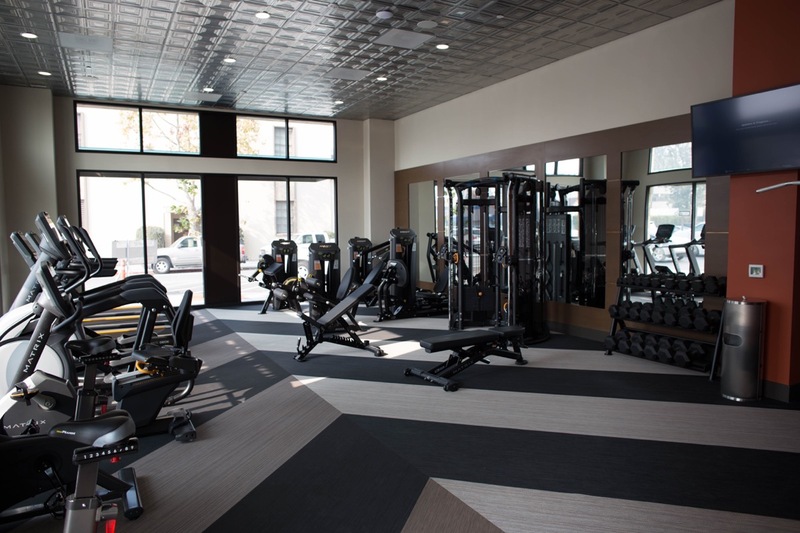 The above photo shows some of the high-end fitness equipment to which Huxley’s residents will have access. It also shows some of the high-end finishes that Greystar has used in this particular development. The stamped metal ceiling, for instance, and the detailed flooring are examples of the type of thing residents and their guests will see in the building’s halls and common areas. From the fitness center we peeked into the building’s “bike lounge,” which in addition to bike storage also features a workshop area where residents can maintain their bicycles. 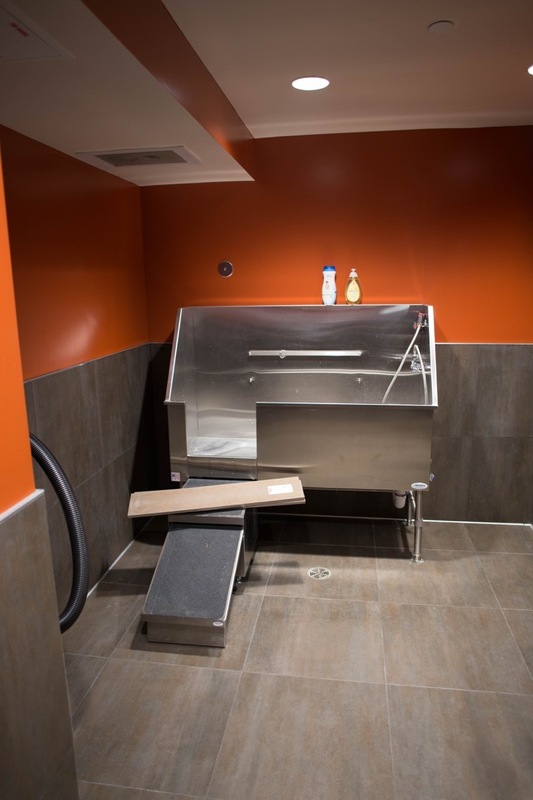 The bike lounge features an external door: residents can wheel their bikes in and out without having to go through the lobby. The bike lounge is where, I believe, one other nice touch, which has yet to be added, will soon be found: an electronic transit board indicating upcoming departures for SamTrans buses and CalTrain trains. Residents will be able to see at a glance whether they have enough time to catch their train or bus, which strikes me as incredibly convenient. As to where those residents will be spending the bulk of their time when at home, we next headed up to the third floor to see a couple of the building’s 137 apartments. One nice feature of this particular building is that the doors, in addition to conventional locks, also have sensors that currently unlock the door using a key fob, but will eventually also work with the resident’s smartphone. And using a smartphone app, residents can “buzz” people into the lobby from anywhere in the world. About those ceilings: as you can see in the above picture, they’re pretty tall. The exact height does vary depending upon which floor the unit is located on, but they are generous regardless. (Forgive the varying light levels in these photos; that’s partly due to the smoky outside conditions and partly due to my photography. These units are nice and bright inside). 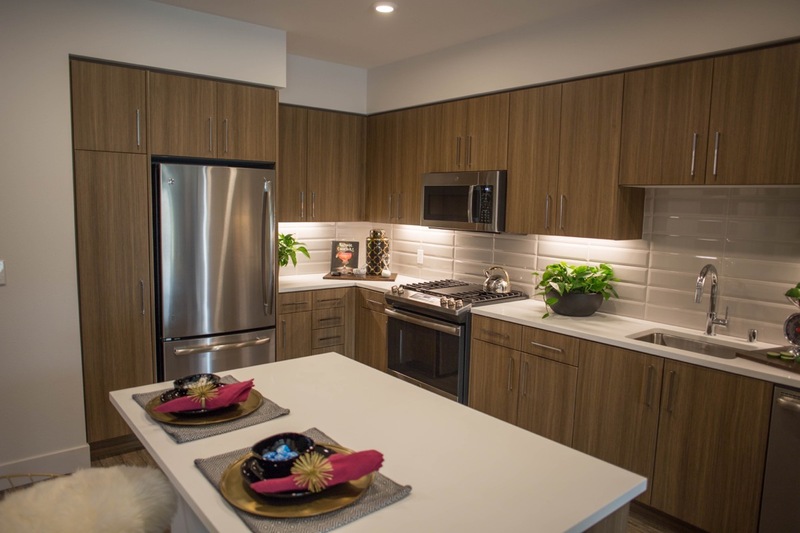 As you can see, these apartments are equipped with quality appliances and fixtures. And the kitchen has a good amount of storage. 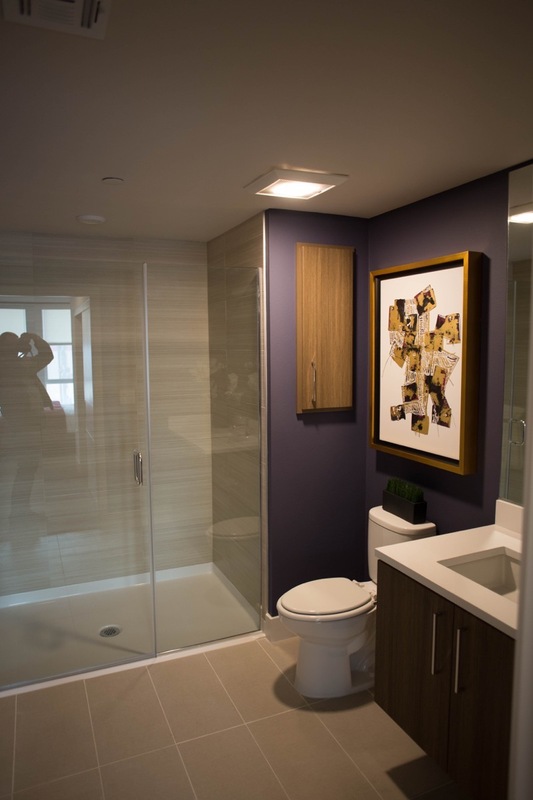 Plus, all units have a front-loading washer and dryer, and the climate is controlled via a Nest thermostat. Some units have usable balconies, although most don’t. This particular unit is one of many in the building with a “Juliette” balcony, in which a balcony railing is affixed right over the windows, leaving no private outdoor space. However, the large operable windows mean that the unit nevertheless receives a great deal of light and air. On the fourth floor, units that face El Camino Real take advantage of the fact that the building steps back at this level: they all have nice-sized decks. Some other units, primarily on the Wilson Street side but also some that face into the building’s open courtyard, have small balconies upon which a resident can sit or stand. The unit layouts vary quite a bit, meaning that there is something for almost everyone. I will note that although children are of course welcome, this building isn’t especially family oriented: the assumed market is urban professionals. There are no child-oriented amenities, and the building isn’t located near any public parks. There are also no three-bedroom units, although as I noted some do have dens. Those dens are fairly small, however, and don’t have closets or even doors to separate them from the unit’s main living space, so although you might choose to put a hide-a-bed in there to accommodate the occasional visitor, don’t plan on using the den as an additional bedroom. Before I leave the apartment units themselves, I should add that they all have wide doorways and bathrooms that appear to be ADA friendly. And some of the units have large walk-in closets. On the building’s “podium level,” which is the level immediately above the lobby, is the Resident Lounge and the building’s outdoor courtyard. Huxley is designed in a rough U-shape, with one leg shorter than the other. The courtyard is thus surrounded on three sides by the building but has a clear view out towards Franklin Street, and a partial view towards Diller Street. The courtyard itself is not terribly large, but is nicely appointed with places to sit, plus BBQs, a ping-pong table, and a large-screen TV. There is a nice little water feature, but I should note that this building has neither a pool nor a spa. This outdoor patio is accessed through the Resident Lounge, which is equipped with soft seating, another large-screen TV, and a pool table. Connecting the two are large glass doors that can be opened wide on nice days, allowing the spaces to work together. Naturally, throughout the area — and in all common areas within the building — there is complimentary WiFi. 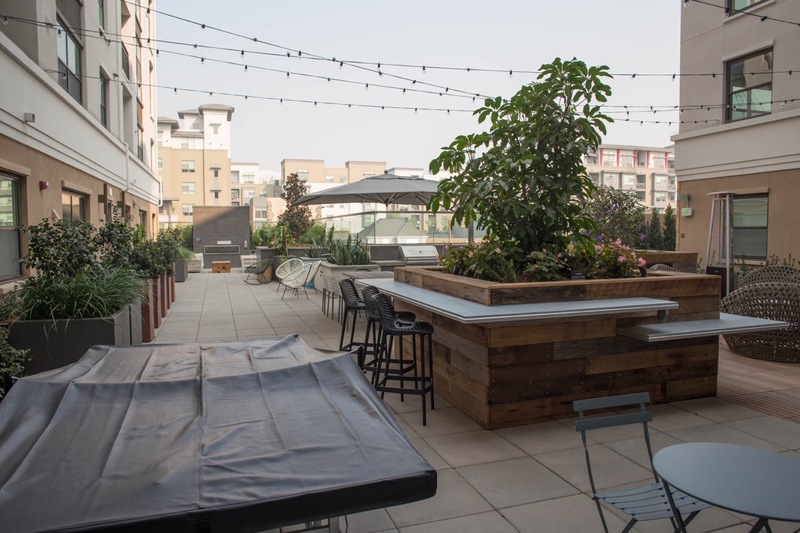 Huxley has an additional common area on the top floor, in the very center of the front facade: a medium-sized “rooftop” deck that faces Redwood City’s western hills. On that deck you’ll find seating and some great views (plus that complimentary WiFi, of course). There is no BBQ up there, so it is more of a hangout space and a place to get some great sunset views. Finally we come to the building’s two-level garage. One level of Huxley’s garage is below ground, while the uppermost level sits behind the public spaces on the ground floor. This garage is interesting in that the two levels are not connected: cars enter and exit the lower level from Wilson Street, while cars heading to or from the upper level use an entrance on Diller Street. This makes a lot of sense: a ramp connecting the two floors would take up valuable space, space that here is used for additional parking spaces. In total, Huxley’s secure parking garage contains 153 spaces, although 16 of those are tandem spaces, in which two cars park nose to tail. Huxley’s parking spaces are unbundled: residents pay separately for them. This allows residents who don’t have cars to avoid having to pay for an unneeded space. As well, residents who have multiple cars can get more than one. A single parking space costs $100 per month, while a tandem space (which accommodates two cars) is $150 per month. Oh, and some of the spaces are of course equipped with EV chargers (and the building is designed so that more can be easily added). 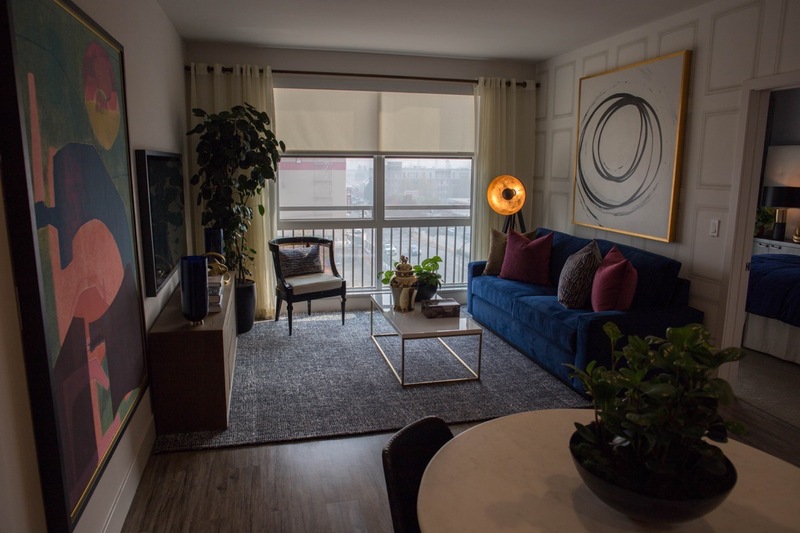 As for the units themselves, not all prices are listed on their website (for some units, you have to ask) but Huxley is asking approximately $3,300 for a low-end studio and close to $4,900 for a two-bedroom apartment. Prices do vary quite a bit, though, presumably based on things such as the apartment size, whether or not the apartment is located on a corner, whether or not it has a balcony and/or a den, and which floor it is located on. In case you are wondering whether people are really paying those prices, I did ask. In the roughly six weeks they’d been leasing (leasing began around the beginning of October, while my tour was on November 15) about 30% of the building’s apartments had been taken. 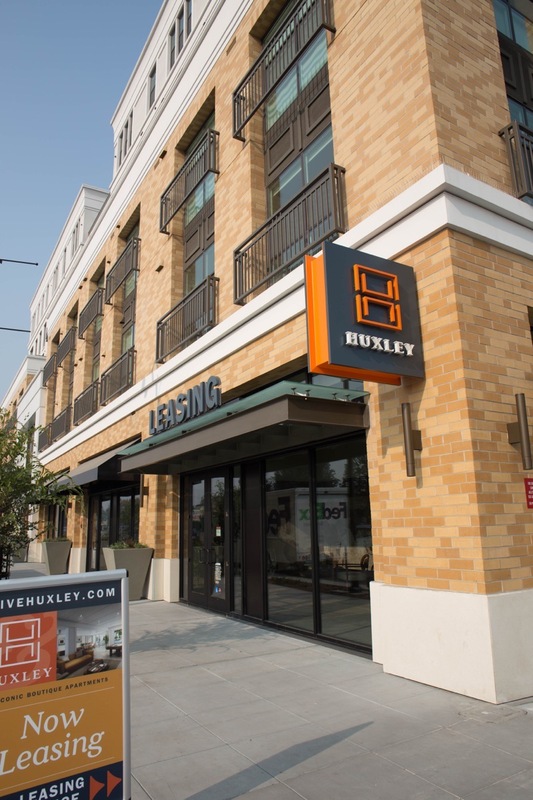 Huxley is well located, being close to Whole Foods, Sequoia Station, Redwood City’s Caltrain station, and, of course, our vibrant downtown. While I was inside I wasn’t particularly aware of either train or road noise. Of course, this building isn’t right on the Caltrain tracks like some others. It is right on El Camino Real, but the double-pane windows seemed to do a good job of blocking out normal traffic noises. Undoubtedly residents will still hear emergency vehicles and such, and when their windows are open all bets are off, but it didn’t seem to me that noise was an issue in this building. That pretty much concluded our tour, but I still had one question: where did “Huxley” come from? Of all the new buildings in Redwood City, perhaps my favorite name is that of the development most people refer to as the “Box” buildings (the two buildings are the world headquarters for Box, Inc.): the official name of the development is “Crossing 900.” Why that? Because the buildings sit at the corner of Jefferson Avenue and Middlefield Road, and address of one building is 900 Jefferson Avenue while the other’s is 900 Middlefield Road. A number of Greystar’s projects use some form of the name “Elan” — their almost-completed project at the corner of Jefferson Avenue and Franklin Street will be called “Elan Redwood City” — but not this one. So where did “Huxley” come from? I had guessed that perhaps it was the name of one of the principals at Greystar, but no. It seems that the company hired a branding firm to come up with a name, and from all of the suggestions they came up with, Huxley was chosen as the favorite. It is as simple as that: it just sounded right to the folks at Greystar, and apparently has no special connotations of any kind. I really enjoyed my tour of Huxley, and I found a lot to like about the building. Before I left Amy asked me if I’d like to lease one, and although I of course said “no” — right now I’m pretty happy with the house that I have — I will admit to some temptation. For now, I’ll continue touring these buildings and seeing how they stack up. Elan Redwood City should be leasing early next year, and the large project being built at 1409 El Camino Real will likely be done and leasing sometime in 2020; they should make interesting comparisons. When I do tour them, I’ll be sure to ask about where the names for those projects — whatever those names end up being — came from. I like that you worked “Juliet” into your “What’s in a Name” post.